Chocolate-Coated Peanut Butter Cup Pretzel Bites ~ Salty, Chocolaty and Crunchy! Salty, chocolaty and crunchy, with a surprise of creamy peanut butter, these adorable pretzel bites make an terrific party dessert! I presented as a Valentine gift this year; however, they'd be well received as a gift any time of the year or as a special treat for your family. Also, they'd make a wonderful project to do with the children. 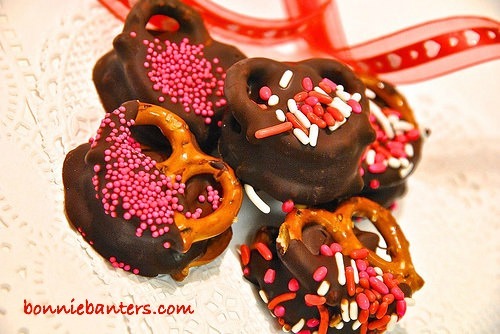 Drench these scrumptious pretzel bites with dark or milk chocolate (I prefer dark) and, for a special touch, adorn with your choice of a variety of toppings. Any way you prefer, you'll love how easy these bites are and they'll love devouring them!